An absorbing and original addition to Shakespeareana, this handbook of production is for all lovers of Shakespeare whether producer, player, scholar or spectator. In four sections, Staging, Actors and Acting, Costume, Music and Dance, it traces Shakespearean production from Elizabethan times to the 1950s when the book was originally published. 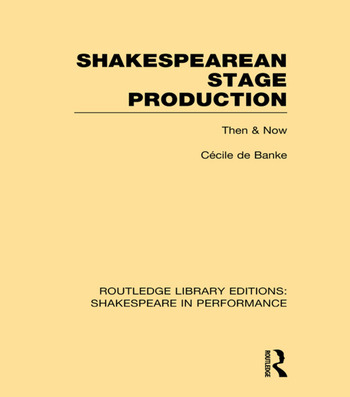 This book suggests that Shakespeare should be performed today on the type of stage for which his plays were written. It analyses the development of the Elizabethan stage, from crude inn-yard performances to the building and use of the famous Globe. Since the Globe saw the enactment of some of the Bard’s greatest dramas, its construction, properties, stage devices, and sound effects are reviewed in detail with suggestions on how a producer can create the same effects on a modern or reconstructed Elizabethan stage. Shakespeare’s plays were written to fit particular groups of actors. The book gives descriptions of the men who formed the acting companies of Elizabethan London and of the actors of Shakespeare’s own company, giving insights into the training and acting that Shakespeare advocated. With full descriptions and pages of reproductions, the costume section shows the types of dress necessary for each play, along with accessories and trimmings. A table of Elizabethan fabrics and colours is included. The final section explores the little-known and interesting story of the integral part of music and dance in Shakespeare’s works. Scene by scene the section discusses appropriate music or song for each play and supplies substitute ideas for Elizabethan instruments. Various dances are described – among them the pavan, gailliard, canary and courante. This book is an invaluable wealth of research, with extensive bibliographies and extra information.